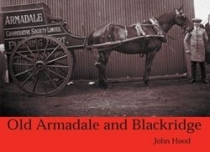 This title showcases the villages of Armadale and Blackridge during their most prosperous period in the early twentieth century. There is a great selection of vintage photographs covering the history of both mining communities and featuring sights such as the Armadale Childrens Gala Day, Armadale Public School, South Street, Chapel School, West Main Street with The Goth public house, Armadale Free Church, Station Road, and the Armadale Station. Featured sights from Blackridge include Bedlormie House, Main Street, Blackridge Public School, the clattering bridge and Westcraigs Road. Also featured in this title are Westcraigs railway station and Northrigg miners cottages.